(Nanowerk Spotlight) In case you haven't seen the absolutely amazing animation Cellular Visions: The Inner Life of a Cell yet, go watch it now. In it, there is a sequence where a motor protein is sort of 'walking' along a filament, dragging this round sphere of lipids behind it. This kind of nanoscale biological motor is able to load/unload particular types of cargo without external stimuli, and transport them along cytoskeletal filaments by using the energy of adenosine triphosphate (ATP) hydrolysis within cells. Nanotechnology researchers are fascinated by the various molecular delivery systems that have evolved in nature and they are receiving increasing attention as blueprints for nanoscale actuators and building blocks to construct artificially-engineered bio-hybrid systems. Some researchers expect that artificial molecular transport systems which utilize microtubules motility (like the cytoskeletal filament the motor protein in the animation was walking along) will be an alternative way to pressure-driven or electrokinetic flow-based microfluidic devices. Researchers in Japan propose a molecular transport system that can achieve autonomous loading/unloading of specified cargoes. This system loads a cargo molecule through DNA hybridization (DNA hybridization: The complementary bases – adenine and thymine, guanine and cytosine – of two single-stranded DNAs bind together to form a double-helix structure) between single-stranded DNAs attached to a cargo molecule and a cargo transporter (step I in diagram below; the schematic runs from right to left). It transports the loaded cargo molecule by using motor proteins to move (glide) the cargo transporter (step II). It then unloads the transported cargo molecule (step III) through DNA hybridization between single-stranded DNAs attached to the cargo molecule and a glass substrate – the DNA strand exchange (upon untwisting a double-stranded DNA, one of the resulting single-stranded DNA and a third single-stranded DNA bind together to form a new double-stranded DNA). "We believe that our results may help create highly miniaturized on-chip-systems – such as molecular sorters, molecular sensors, and molecular communication systems – because our molecular delivery system can autonomously load, transport and unload cargoes by exploiting DNA hybridization and a biological motor system," Satoshi Hiyama explains to Nanowerk. Hiyama, a member of the Frontier Technology Research Group at NTT DoCoMo's Research Labs in Kanagawa, Japan, is first author of a recent paper in Small titled "Autonomous Loading, Transport, and Unloading of Specified Cargoes by Using DNA Hybridization and Biological Motor-Based Motility". The NTT DoCoMo team, in experiments carried out jointly with Professor Kazuo Sutoh of the Department of Life Sciences, The University of Tokyo, and Associate Professor Shoji Takeuchi of the Institute of Industrial Science, The University of Tokyo, has successfully demonstrated the world's first molecular delivery system for molecular communication. DoCoMo has been pioneering research into the field of molecular communication, a new communication paradigm in which molecules are used as a communication medium. By combining communication technology and biochemistry, DoCoMo aims to develop systems that could transmit information about the biochemical conditions of living organisms, such as excitement, emotion, stress or disease. The idea is to construct a controllable, biochemically engineered communication system using cell-to-cell communication and other biological signal-transduction mechanisms in which living organisms transmit/control biochemical information and reactions, such as excitement and emotions, that are hard to encode/transmit using electromagnetic waves. The experiment by the Japanese research group has confirmed the feasibility of a proposed delivery system to transport specific molecules using artificially synthesized DNAs and chemically energized motor proteins, typically found in muscles and nerve cells, which are capable of moving autonomously by converting chemical energy into mechanical work. Hiyama explains that, in order to exploit the highly selective hybridization and strand-exchange reactions for reliable loading and unloading of cargoes, they need to further suppress nonspecific loading and unloading of cargoes, which results mainly from nonspecific interactions of cargoes with gliding microtubules or with an unloading surface, but not from mismatched hybridization. "This could be achieved by using other types of cargoes with less affinity to microtubules or to a glass surface" he says. "With such an improvement, these autonomous operations may help create highly miniaturized on-chip systems such as molecular sorters, sensors, and communication systems. This may also be an alternative way to realize pressure-driven or electrokinetic flow-based microfluidic devices." The system, which functions on its own because it does not require external power supply or control, could help lead to the realization of a biochemical analyzer, or biochip, a fingertip-sized microchip for biological and chemical analysis. The envisioned molecular delivery system could have many applications in medicine and healthcare. For instance, it may be possible to diagnose diseases or stress by directly analyzing biomolecules in a drop of sweat or blood using a mobile phone equipped with a biochip. The molecular delivery system would be packaged in the biochip, and the data generated in the biochemical analysis would be transmitted to a medical specialist via a mobile phone using traditional wireless technology (not surprisingly, this research was sponsored by a telephone company, after all). The system could be used, for example, for remote health checks or preventive medicine. 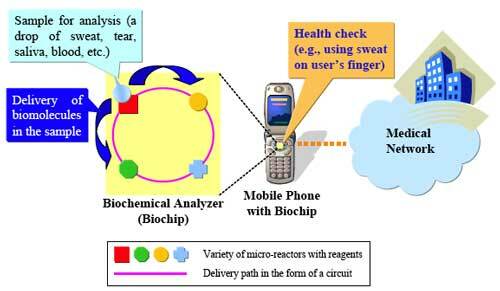 A mobile phone with a biochip could also have applications beyond healthcare, for instance in environmental monitoring, e.g. water analysis.